Nokia (/Microsoft) has launched the second device in its Android line after the Nokia XL, a larger version of its original Nokia X smartphone, went on sale across Asia and the Middle East for €109 (around $150). Like the Nokia X, the XL will not be sold in the US. Update: This article originally stated that the converted price is $265, but it is around $150. Apologies for any confusion caused. The Nokia XL is much like its older sibling in terms of aesthetics, albeit that it has a five-inch screen, better quality cameras and dual-SIM support. The phone is powered by an updated version of Nokia X Platform, the company’s forked version of Android, which means it can run Android apps and Microsoft services like OneDrive (which comes pre-loaded) and Skype. 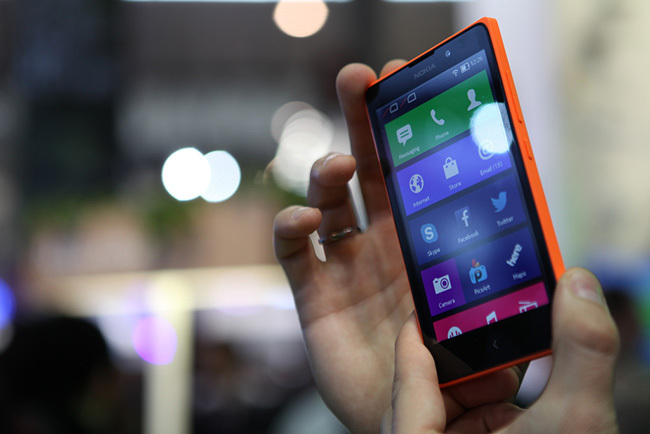 The user interface bears similarities to Nokia’s higher-end Lumia smartphones with a tiled-style home screen for apps and services. Under the hood, the XL is powered by a 1 GHz Qualcomm Snapdragon Dual Core Processor and includes 768 MB of RAM. The device supports up to 32 GB in external memory, and comes with a five-megapixel camera with a two-megapixel front-facing snapper. In addition to GPS, it includes an accelerometer and is available in bright green, orange, cyan, yellow, black or white. Nokia says that owners of the original Nokia X can upgrade to the latest version of the Nokia X Platform to get all the software benefits of its new release.